Scottish glass wool insulation manufacturer, Superglass, has developed the ultimate tea cosy and pitted it against the traditional woolly cosy in a Facebook Live video. The tea cosy, made of 84% recycled glass wool insulation, kept an identical tea pot hotter over a 90-minute period in an experiment broadcast live on social media. Filled with identical volumes of water, boiled in identical kettles and measured with identical thermometers. By the end of the 90-minute experiment, the Superglass pot registered 67.7°C and the traditional cosy was down to 55.0°C. Builders across the country use Superglass’ glass wool insulation to insulate homes and buildings, but the company’s product can also keep their favourite beverage hotter for longer, particularly at this time of year. 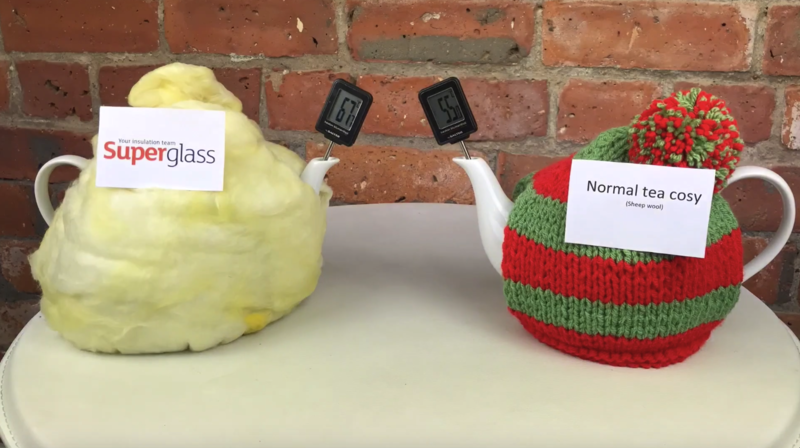 Bob Dalrymple, Head of Marketing at Superglass, said: “Of course, the tea cosy video is a bit of fun, but it highlights just how much of a difference good insulation can make. “Not only does it keep the heat in, but it also helps to keep bills down and reduces the need to burn energy. We estimate that our product saves more than 300% of the energy used to manufacture it over its lifespan.